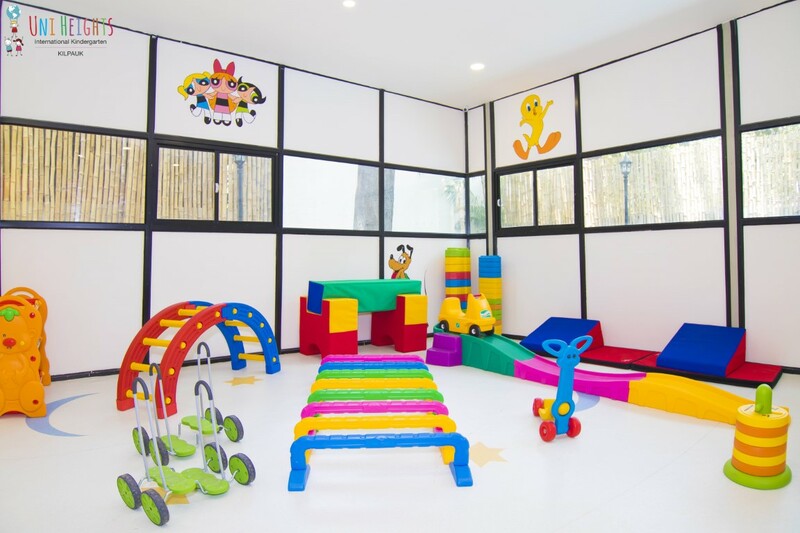 Uniheights is a place where each and every aspect of child personality, his honored like basic intelligence, motor skill, logistic thinking, problem solving, observation power and so on. Emotional competence and empathy are developed through play as children learn about the feelings, emotions and motivations of others. It is essential to provide opportunities for young children to engage in dramatized play to demonstrate ways of caring and showing empathy. 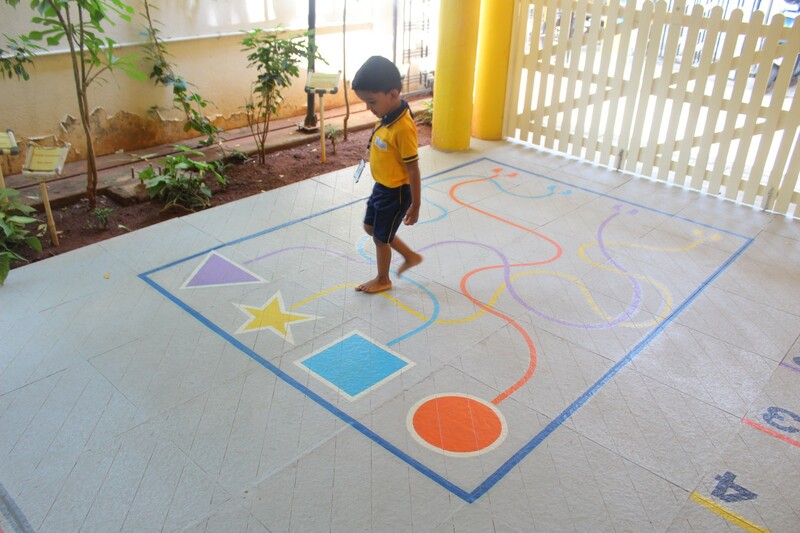 At Uniheights, we focus on the individual development of each child through the play-way method. This provides children with an opportunity to play and learn at the same time, growing as individuals in the process. It helps children to engage with their peers, engage all of their senses, and work through their thoughts and feelings. Escaping into an imaginary world:- A world without boundaries that they can freely explore. Simple gesture with hands bring life to the inert puppets, moving their little arms and mouths to animate a topic. Easy to operate, the children too can play with the puppets—bringing them to life and attributing personalities, characteristics, attitudes, and more. The puppet can become anyone or anything he or she wants. A best friend perhaps. Maybe even a sibling, teacher, or pet. It does not really matter because the world children create with puppets is entirely their own, a world without boundaries that they can freely explore. When used in the classroom, these puppets can help boost creativity and stimulate kids’ imaginations. It help in developing their speaking and listening skills. Children often communicate easily with puppets, giving them confidence to express their ideas and feelings. We at Uniheights, conduct excursions according to the theme. This is intended to make learning lively and interactive for our students, allowing them to visually engage with concepts. It provide a purpose of the trip which usually allow students to get experiences outside their everyday activities and give them a chance to think about a topic from a different perspective and engaging with content in a variety of ways. Gym is an important part of a holistic curriculum. Gym is one of the favorite classes in their day. We make ensure that the lessons are fun and that attention is paid to designing exciting and engaging games. It gives an opportunity to develop their gross motor skills. Activities during indoor and outdoor increase their ability of confidence, flexibility and strength and communication skills. 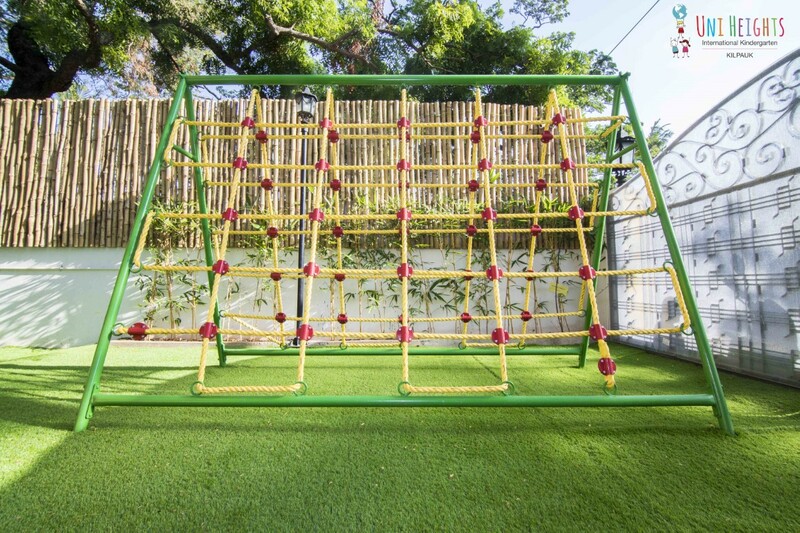 Gym activities are organized both outdoors and indoors taking advantage of different environments with structured play as well as unstructured play. Through exploration and investment in varied activities and games children also develops their social and emotional, cognitive skills and grow in self-confidence. Splash pool is an inevitable part in the development of the children as it helps in gross motor development, and eye hand co-ordination. To beat the heat of summer children enjoy a dip in the water of splash pool. This is a great activity to indulge in, as it helps to strengthen the child’s body balance, muscle strength and coordination and boosts social growth as children get an opportunity to interact with one another in fun. Bubbling with excitement and enthusiasm, in their colorful swim suits the children thoroughly enjoyed the splash pool activity, jumping in the water, splashing water at their friends and playing with floating toys. 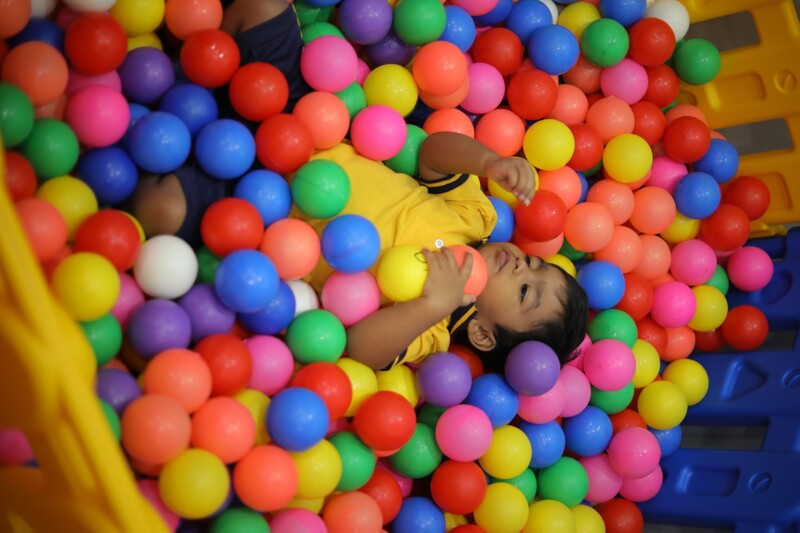 A room filled with balls of myriad colors develop grasping skills, eye-hand coordination, motor skills, tracking, finger muscles, and the ability to move objects from one hand to another. They begin to get the feel of repetitive rhythms – bouncing, grasping, and squeezing. It helps children master individual gross-motor skills, such as kicking, throwing, catching, aiming, rolling, bouncing, and tracking. 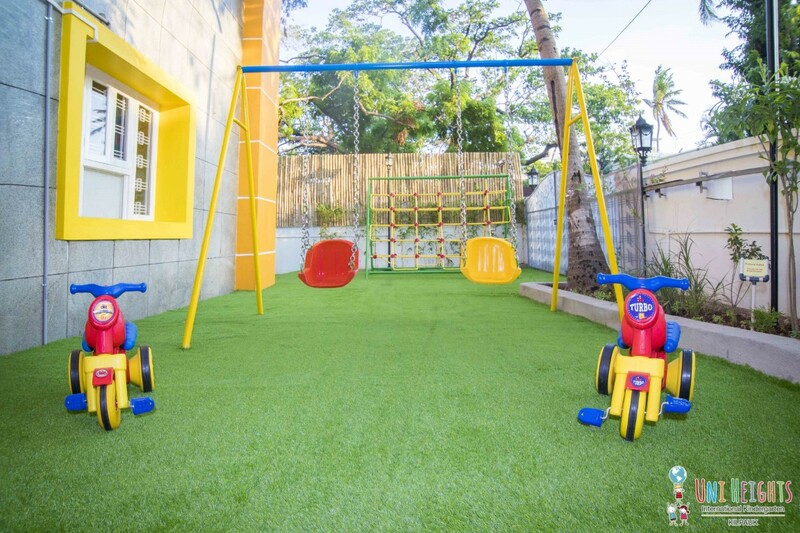 It plays an important role in developing their Social skills equally by playing with their friends and participating in jumping, rolling and throwing balls to one another. Though this children are often beginning to learn the games of their cultures. A virtual world that helps child to develop socially. They also get an opportunity to learn on their own with role play and helps develop a child’s imagination as they encounter creative, imagined scenarios with their dolls and other children. It helps child to grow emotionally which teaches them to empathize with those around them and allows them to grow up into caring people. While playing children run into new and unique situations for their games. By communicating in this way with their friends, children gain insight into home routines that may be different from their own. In this way they discover the world around them.